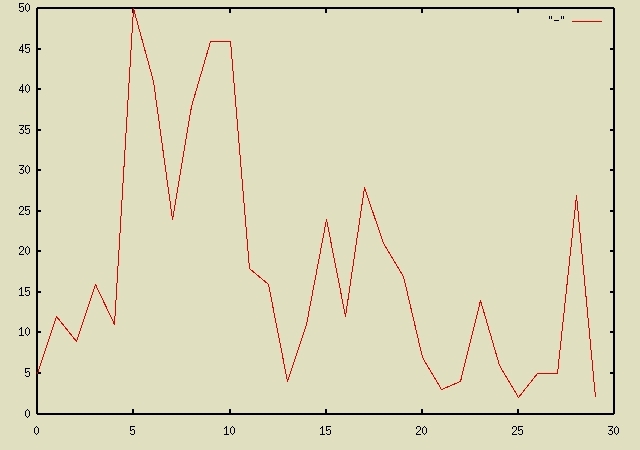 A nice bonus: plot passes its arguments straight to gnuplot's plot command. Want bargraphs? Being able to create and manipulate GUI widgets in shell scripts opens up a whole new modality for them. The plot command above can be thought to be obtained by taking a command under a subordinate shell - gnuplot - and 'exporting' it to the top-level shell. This happens to me all the time: I get used to typing a command in a subordinate shell, start typing it in my shell by mistake, and eventually go, "Aha!" A case in point: when I started using p[rint] in gdb as my calculator,3 it was only a matter of time before I wanted to have the same command in my shell. If you think you need to split the generated html into multiple files you probably have too many pictures for your audience's liking. to overloading mkdir, rmdir, rm, cp, mv.. Crucial decisions are what portions of the file system to index, and how to order paths with common names like in the above example. 0. This graph plots by date the #mails I sent/received for the month of November 2004. Notice the spike right before the presidential elections. 1. The other commands in that pipe are simple stubs in perl. I have a lot of those. 2. Requires python and wish. 3. A habit I picked up from Karu. 4. agrep is a better grep. 5. Requires netpbm and vim.